A seed can be defined as the reproductive structure of a plant. The Structure of a Seed contains different parts that are used for various purposes. In actual fact, a seed is a fertilized mature ovule. It possesses an embryonic plant covered in a protective coat. There may be some differences in the shape, size, color or surface of the seed but they produce along the same plan. The size of a seed ranges from as small as a dust particle to as large as the size of a coconut. The type of surface also varies from one seed to another. It may be smooth, wrinkled, striate, ribbed, pulpy, and hairy. A completely mature seed contains the plant embryo. It also has reserved food material for the growth of the plant and covered with a protective layer called seed coat. These seeds are attached to the fruit wall by a small stalk. This small stalk is known as the funiculus. When the seed reaches maturity, a narrow scar becomes visible. This scar represents the point of attachment of the seed and the stalk. It is known as the hilum. A minute pore is situated close to this hilum. It is known as micropyle. Micropyle is used mainly for water absorption during seed germination and then the radical comes out through this. The embryonic root is known as the radical that grows and develops into the root system of the plant. The protective layer of the seed is made up of two distinct seed coats. The fleshy outer coat is whitish in color, called testa and the inner thin and membranous covering is known as tegmen. Seed coats provide protection to the embryo. Some special structures besides the basic structures may arise during seed development. For example, a fleshy whitish tissue develops in castor bean. Declan, Tobin. " Structure of a Seed Facts for Kids ." Easy Science for Kids, Apr 2019. Web. 26 Apr 2019. 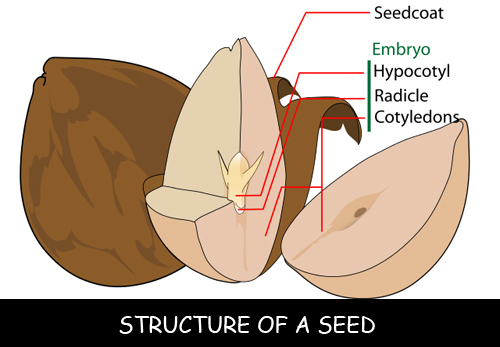 < https://easyscienceforkids.com/structure-of-a-seed/ >.